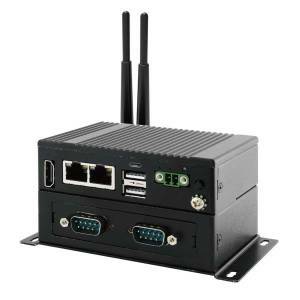 Winmate introduced unique series for an industrial IoT in fanless rugged design. The systems can be mounted to Wall, Desk or via VESA/DIN-Rail (by request). Thanks to compact dimensions (only 100x115x31 mm for EACIL22S and 100x70x31 mm for EACFA20) the novelties can be installed in a wide range of complicated industrials places with limited space. With special metal coating IoT Gateways can be operate between 0 to 55C and have IEC60068-2-27 shock and IEC60068-2-64 vibration compliant. One of the main feature of EACIL22S series – is possibility to transferring video, usb data and power delivery (up to 10W) thanks to USB Type C with alt-mode. Customer need only one cable, it means the need of a lot of cables has disappeared. By request, the model can be upgraded with additional Wi-Fi module with 2 antennas or with CAN Bus module. The EACFA20 ARM-based IoT Gateway can be extended additional modules, like Wi-Fi, 4G LTE, 16bit DIO, USB or COM ports, CAN Bus. These modules come as other box with the same size and added as slices.